Okay Gang, just where was this photo taken 75 years ago? HINTS: Yes, it was Whitney Avenue. Yes, it was Centerville. The white house is still standing, but not there anymore. The house with all those windows on the right is gone. Got it yet? Gil Spencer solved the mystery of the location of the two Memorial Day 1942 photos featured in the June 16, 2017 website update. Gil said that he thought the white house looked like the one that stood on Whitney Avenue near the corner of Colonial Drive until was moved to Colonial Drive to make way for the Whitney Medical Center. Interesting theory, we thought. But what about that dark house with all the windows? Wouldn't that be where Colonial Drive is today? 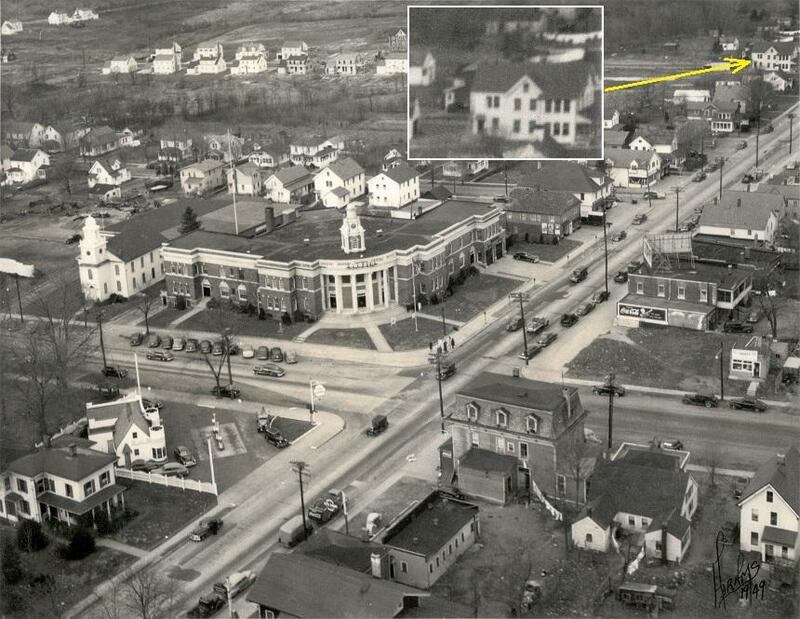 A 1934 aerial view of Centerville confirmed that such a house did stand just north of the "white" house, where today Colonial Drive meets Whitney Avenue. 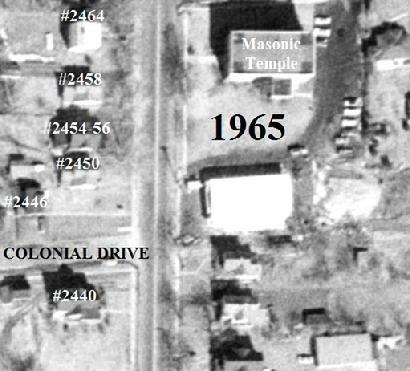 Further proof was gleaned from the 1949 aerial view of Centerville, which clearly shows the "white" house in its former location and the new Colonial Drive under construction. The above 1949 photo of Centerville clearly shows the "white house" in the 1942 Memorial Day photograph. It was #2440 Whitney Avenue until it was moved around the corner to Colonial Drive around 1984. The darker house with all those windows, #2442-44 Whitney Avenue (above, left), was torn down around 1948 to make way for Colonial Drive. (It was still listed in the 1948 City Directory.) The large building at #2446 Whitney Avenue in the photo taken last week (above, right) was built two years ago and replaced a much smaller house at the same location. These aerial views taken in 1934 and 1965 confirm that #2442-44 Whitney Avenue, the house with all the windows, immediately north of the "white" house, was torn down when Colonial Drive was cut through in 1948-49. "Sun" Cleaners opened in 1948; became "Rainbow" Cleaners in the 1960. Rainbow Cleaners and Dyers Inc. was established by Arthur and Richard Verneris after being discharged from the service. 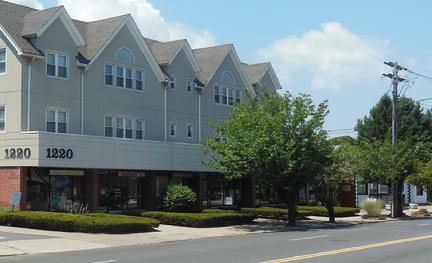 Rainbow Cleaners' first location was at Francis Avenue in Hamden. 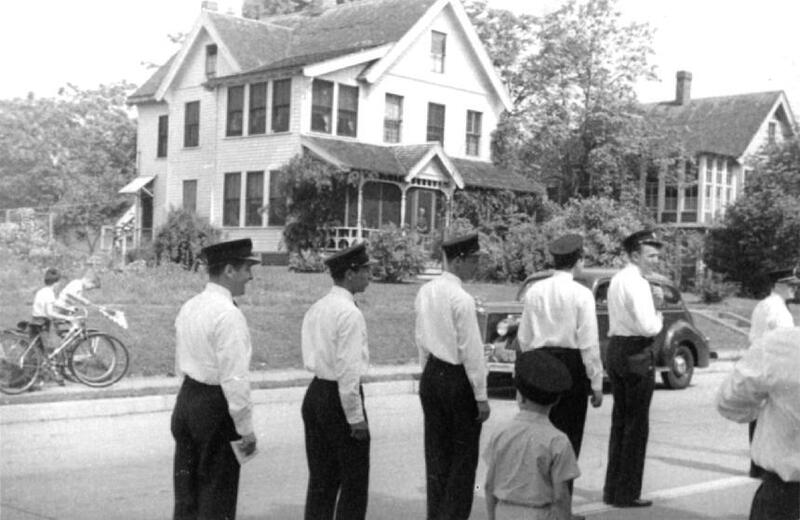 In 1950 the cleaners moved to 1380 Dixwell Avenue where they remained for 10 years. The move provided the brothers with a larger establishment to better serve there customers. In the spring of 1960, the cleaners moved again to 1540 Dixwell Avenue, where it is still in existance. 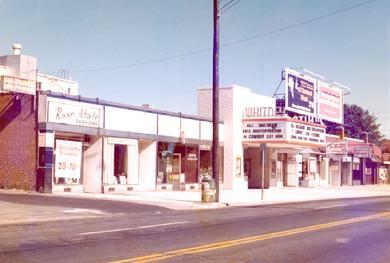 Later that year, Rainbow Cleaners at 2600 Whitney Avenue was opened. Arthur managed the Whitney Avenue store while Richard remained at the Dixwell Avenue location. Business remained as usual until the retirement of Arthur and Richard, whereas Karen, Jeanne, and Bill are currently managing the Whitney Avenue store, and Marc and Matthew Verneris are managing the Dixwell Avenue store. CLICK to enlarge either photo. Armed with a brand new Pentax camera in 1978, the photographer thought it a good idea to shoot the Whitney Theater while it was still around. It stuck around for about five years more before being converted into yet another Hamden condo heaven. 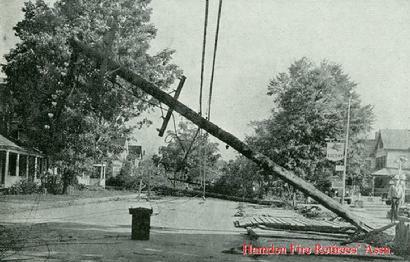 Although there are no known records of major emergencies occurring at the Whitney, the Hamden Fire Department was no stranger to the place. One retiree recalled climbing an extension ladder to the parapet right above the marquee one night to check for smoke. In total darkness, he nearly stepped off into nothing. Another retiree recalled watching "Gremlins" at the Whitney shortly before it closed for good, only to be interrupted by a couple of fellow Hamden firefighters who were there officially, in their turnout gear. The manager apparently did not wish to spook the patrons with a silly announcement that the fire department had been summoned for whatever. It has been said that on its final night of operation, the Whitney played the same film that it featured on its first night of operation in 1940. What a way to go! Looking at the photo, some of us can still smell the popcorn. Identical view 34 years later - ALL GONE! 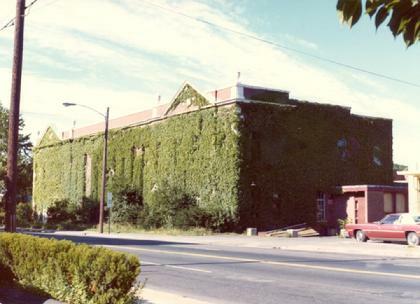 The old Brock-Hall Dairy building at 1204 Whitney Avenue appears to be boarded up in this July 11, 1978 photo that was shot at the same time as the photo of the Whitney Theater that was posted last week. The same view 34 years later is devoid of any buildings, just trees. A five-story condominium building was constructed further back off Whitney Avenue at the same address in 1985. Messrs. Brock and Hall were influential members of the Whitneyville Volunteer Fire Association from its inception in 1910. 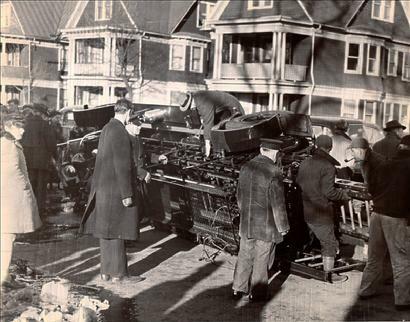 While the new Putnam Avenue firehouse was under construction from October 1926 until May of 1927, Co. 3's apparatus was housed at the home of H.F. Hall at 116 Putnam Avenue. 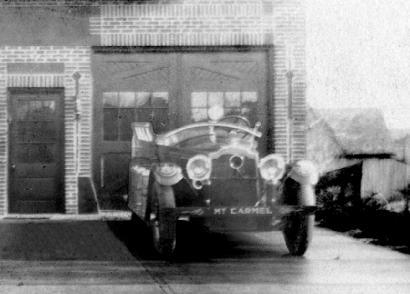 From the Station 3 Log Book (1926-1947): "We moved our [1910 Locomobile and 1915 Maxim] from the old Fire house to H.F. Hall's garage on Thursday Nov. 18, 1926. 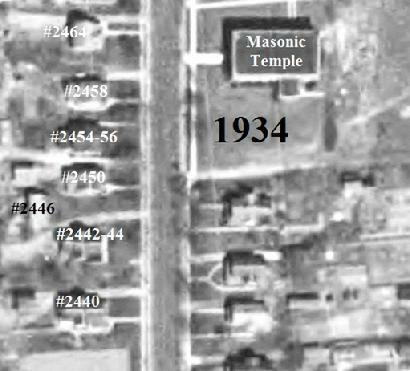 Was moved back to New quaters (sic) Saturday May 15, 1927." Ironically, during that same period of time, on April 24, 1927, a fire did $33,500 in damages to the dairy's garage. The gasoline shortage during World War II required the dairy to employ horse drawn milk wagons once again for home deliveries in the Whitneyville area, a practice that remained in effect for a couple of years after the war. The Brock-Hall dairy ceased operations in the late 1970s and the building was razed shortly thereafter. This photo was taken from a 1950 edition of The Hamden Chronicle. It was part of an advertisement for the Hamden Tire Co., 2276 Whitney Avenue. There have been lots of changes along the west side of Whitney Avenue in Centerville, as seen in the photo below. 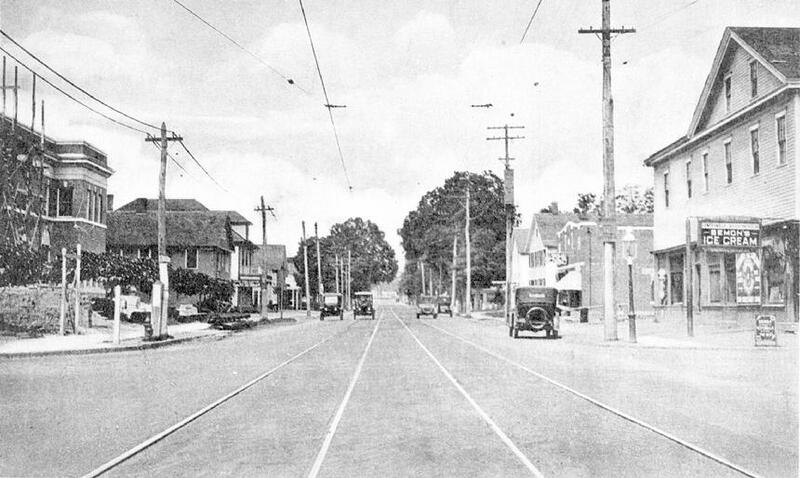 This is the view looking north on Whitney Avenue at Dixwell eighty-six years ago. The new Memorial Town Hall at left is still under construction, as evidenced by the scaffolding seen in the photo. The original town hall, completed in 1888, was only 36 years old when it was torn down to make way for the much larger edifice that took its place. The small Centerville fire station, constructed in 1907, was also razed for the project. The Malovolti Building on the northeast corner of Whitney and Dixwell was razed after being gutted by fire in February 1941. The site remained vacant until the Brown Stone House Restaurant was built in 1949. Note the ancient gas lit street lamp on the corner. In addition to Memorial Town Hall, several other structures in this photo remain standing today, including the building immediately north of the town hall (presently scheduled for demolition), the brick building right across the street, and the wood frame building just north of it. The "Bank Section" of Hamden was given that lasting nickname because of the imposing structure at the fork of Dixwell and Circular Avenues that once housed the Union and New Haven Trust Company (later Union Trust). Notice that the French-Italian Building is under construction at the corner of Dixwell and Helen. Old Station 3, complete with bell tower on the northwest corner of the building, can be seen opposite a large vacant lot on Putnam Avenue in this aerial view of the east side of Whitney Avenue in Whitneyville. Many of these buildings in this late-1940s photograph are still standing in October 2009. The date of the photo is estimated by what appears to be a 1948, '49 or '50 Packard in the parking lot of the service station on the corner of Whitney and Putnam. This photo may have been taken on the same occasion (and by the same photographer) as aerial photos of Centerville and the "Bank Section" known to have been taken in 1949.
following an accident on Dixwell Avenue just north of Mather Street. 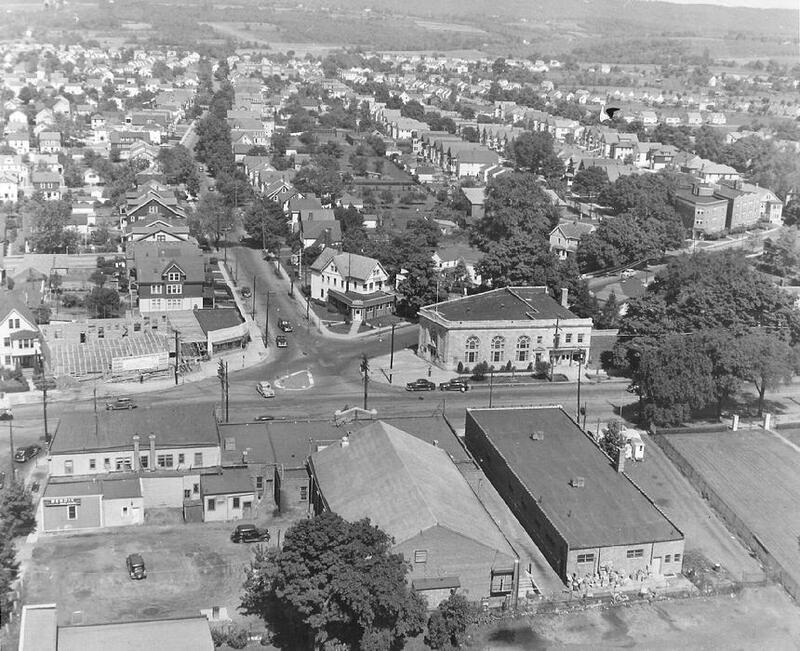 Hamden has changed enormously in 75 years, but those Dixwell Avenue houses in the background in the photo at left are still here and look very much the same today as then. 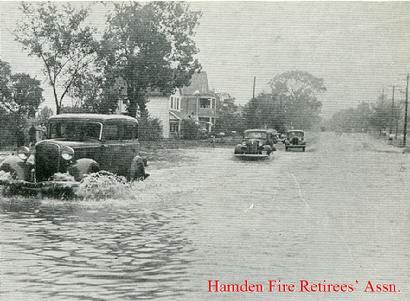 In the 1938 booklet, The New England Hurricane, the photo on the left was captioned, "Dixwell Avenue, Hamden, near the Hamden High School." The two houses are actually located on the southeast corner of Dixwell Avenue and Wheeler Street, a location that most folks today would not think of as "near" the high school. This is probably because a major landmark that now separates these two locations, the Wilbur Cross Parkway overpass, did not exist in 1938. The same two houses still stand today, although the one closest to the camera now has an enclosed fire escape on the near side. The Yantic Beef Co., known locally as "The Big 'Y'", was razed around 1980 in conjunction with the anticipated construction of a brand new stretch of Sherman Avenue between Whitney Avenue and Old Hill Road. Some Hamden oldtimers have told us that the Web Shop was once known as "the poor man's high school." 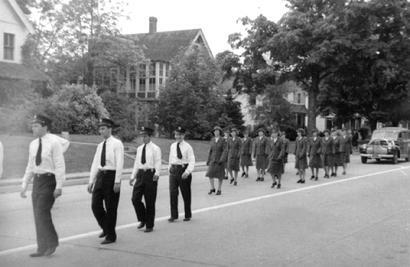 After graduating from 8th grade, many young Hamden boys and girls chose to work there to help support their families rather than attend New Haven High School (AKA Hillhouse). 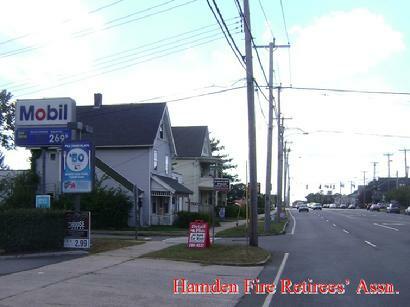 Several Hamden firemen worked at the Web Shop in Centerville before joining the fire department. Among them were Mario "Bucky" Serafino and Al Purce. The building was located on the east side of Whitney Avenue at Mill River, where the Wilbur Cross Pky. now crosses. Home of the American Mills Co. until the late 1930s, the building was torn down about 1940 to make way for the parkway. For more photos and stories about the Web Shop CLICK here. Hamden is changing all the time. But the one area of Hamden that probably saw the most change between 1970 and 1980 was Mount Carmel. Between 1974 and 1976, construction of the Route 40 Connector to I-91 resulted in the demolition of almost every building between Our Lady of Mount Carmel Church and the corners of Ives/Dickerman Streets and Whitney Avenue. Bolton Street is among a few Hamden streets that have been cut short, reconfigured, or have disappeared altogether. It ran west off #2902 Whitney Avenue in Mt. Carmel, up a steep hill to just beyond Villa Road. The portion of Bolton Street between Whitney and Villa was eliminated when the Rt. 40 Connector was built in the mid-1970s. Several houses on the street were either razed or moved. What's left of Bolton Street today is accessible only from the end of Villa Road, off Dickerman Street. The street was extended west and south to a cul-de-sac after 1990, and there are more houses on Bolton Street today than before the Connector. The Route 40 Connector also forced the rerouting of Tabor Street, which ran west off Whitney Avenue about 300 feet south of Ives Street. Tabor Street now runs south, then west, off Dickerman Street about 50 feet west of Whitney. The lone house on Tabor Street was not affected by the Connector and still stands. Aerial view in March 1965. A little more than ten years later the Route 40 Connector would dominate this scene, eliminating the lower half of Bolton Street and almost every structure on Whitney Avenue from Our Lady of Mt. Carmel Church to Ives Street. 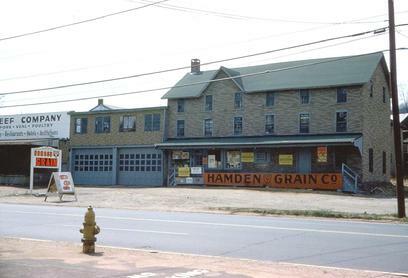 Hamden Grain and Produce Co. and Yantic Beef Co.
Further north on the west side of Whitney Avenue was a group of large wood frame offices and warehouses that housed the Hamden Grain and Produce Co. and the Yantic Beef Co., known locally as "The Big 'Y'." Ever mindful of the fire load of these buildings, Hamden firefighters often speculated that if the Big Y ever caught fire, it would indeed be the "Big One." These buildings were razed around 1980 in conjunction with the anticipated construction of a brand new stretch of Sherman Avenue between Whitney Avenue and Old Hill Road. The old segment of Sherman Avenue, which ran between the Mount Carmel Congregational Church and the church parish house, was re-routed to exit on the new stretch of Sherman Avenue just west of Whitney. It was renamed Kenwood Avenue because it had become an extension of the original Kenwood Avenue. Depot Road and Railroad Avenue, which ran west and north off the old segment of Sherman Avenue, disappeared altogether. Whitney Lane ran west off Whitney Avenue opposite the old Web Shop in Centerville. 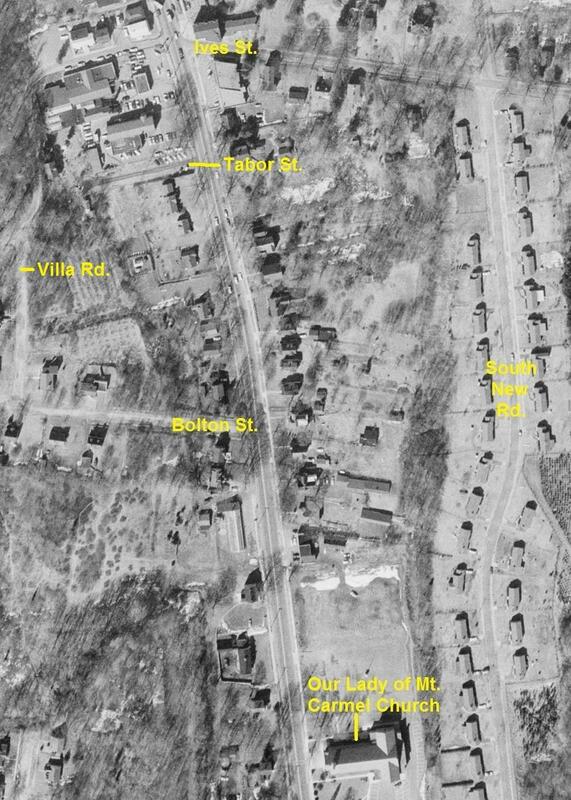 That street, and the several houses located there, were all casualties of the Wilbur Cross Parkway construction of the 1940s. 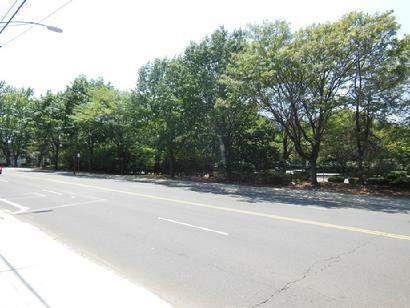 Construction of the Wilbur Cross Parkway also resulted in changes elsewhere in Hamden. Did you ever wonder why the house numbers on Mix Avenue start in the 400s? Mix Avenue originally began at Circular Avenue, not Benham Street. Around 1948, construction of the Wilbur Cross Parkway bisected Mix Avenue between Benham and Roosevelt Streets. The southern half of what had been Mix Avenue, from house numbers 1 to 333, became Battis Road. 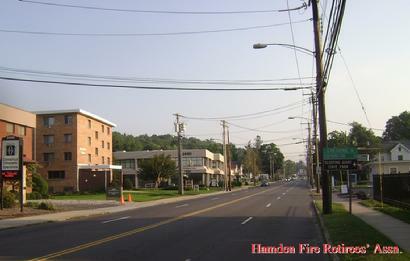 Hobson Avenue runs east of and parallel to Dixwell Avenue, just south of the Parkway. Hobson Avenue originally ran all the way from Wheeler St. to Marietta St. (opp. the high school). In 1948, the Parkway made Hobson Avenue a dead end street just north of Miles Street. In the early 1960s, the Town reclaimed the land that was once Watson Street, which ran south from Goodrich Street to the New Haven line. Connell Street disappeared about 70 years ago. Probably an unimproved right-of-way, Connell Street ran from Bowen Street to Warner Street, in the area between Arch and Easton Streets.